The evolution of wild species, adapting them to human management practices, can cause localised extinctions when those practices rapidly change. And in a new study published in Nature, Professors Michael C. Singer and Camille Parmesan have used more than 30 years of research to fully document an example of this process. As soon as the butterflies encountered the plantain, their caterpillars survived better on it than on their traditional host, Blue-Eyed Mary (Collinsia parviflora), causing the adults to evolve preference for laying eggs on the plantain. By the mid-2000s, they were 100% reliant on the plantain and the Collinsia had been abandoned. 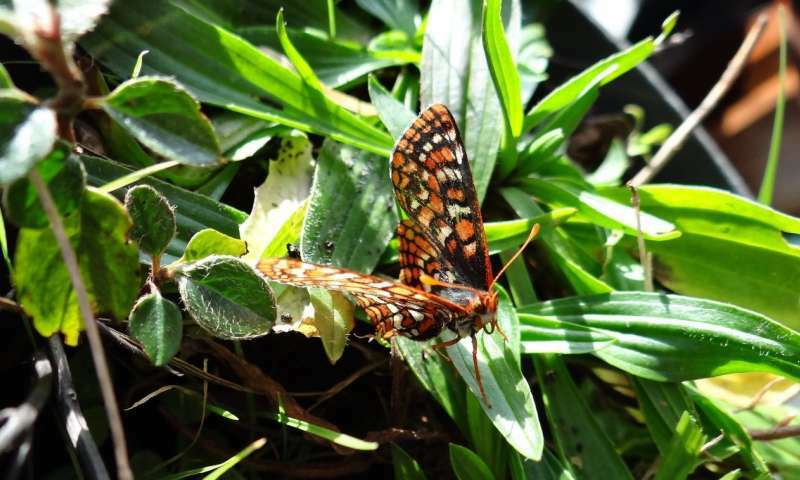 Around five years after the extinction, Edith's checkerspots recolonized the meadow. Since they were all found feeding on Collinsia, the original host plant, scientists believe these colonists to be a new population, and that the lineage which had called the ranch home for several decades no longer exists. Professor Singer, who has been studying the diet of Edith's checkerspot for more than 50 years and led the current study, said: "This is a clear example of how humans are able to change habitats faster than even rapidly-evolving species can change their behaviour. This cannot be not an isolated phenomenon, so unless we become aware of the potential consequences of such actions we will continue to inadvertently cause population extinctions of native species, without recognizing what we are doing. Species-level extinctions are possible when human activities are synchronized across wide areas." Professor Parmesan, a lead contributor to the Intergovernmental Panel on Climate Change which was awarded the Nobel Peace Prize in 2007, said the study had potentially wider implications beyond the scope of changes to farming practices. She added: "Climate warming is another form of anthropogenic change that is occurring faster than past natural changes, and is likely to cause problems for species whose evolution is unable to keep pace. If climate change were natural, it is likely that many wild species would be able to adapt, both through current evolution and through flexible changes in behaviour and life history. But human-driven climate change is occurring at a much faster rate than most past major climatic shifts. Ecologists have long been arguing that this is likely to lead to more extinctions than have happened with past climatic changes and this study supports the arguments that rapid climate change will prove detrimental to biodiversity both in the short and long term."